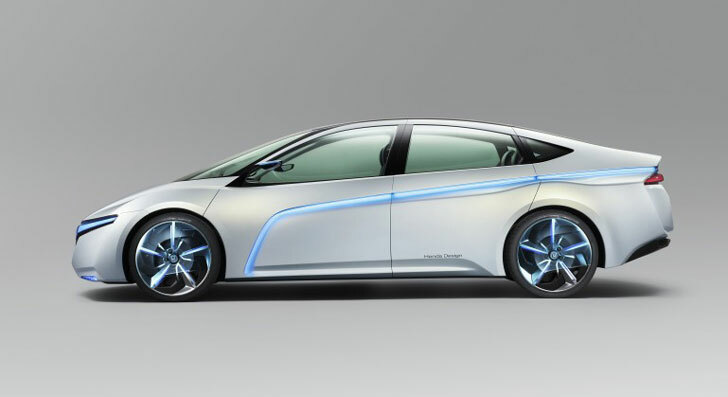 Honda has leaked renderings of its upcoming AC-X Concept Plug-in Hybrid in advance of the Tokyo Motor Show next month, and they show a car with extremely advanced aerodynamics for improved efficiency. Details include adjustable bumpers, wheel covers, and other adaptable aerodynamic bits to create a super-efficient hybrid that can perform well even at high speeds. This is the sort of technology usually reserved for Formula 1 racing, though many types of underbody vehicle adjustments are banned even there because of the extreme costs involved in developing them. We know Honda has quietly been updating its wind tunnels recently, and this new technology must have been part of the reason. The AC-X features a lot of high tech bits inside as well, including a panoramic display screen and joystick controllers. Also in the plans is an iPhone app or “Smart Connect” key with display that helps you monitor the level of charge in your vehicle and connect with it remotely. 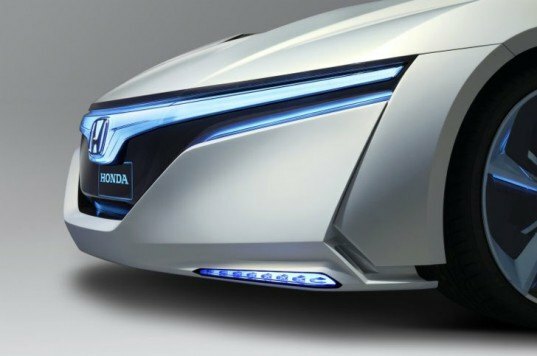 Other than the joysticks, we can see a lot of practical Honda touches in this vehicle, so don’t be surprised if some economical version of these technologies makes it into production Hondas in a few years. The front bumper on the AC-X comes down for improved aerodynamics at high speeds. This is the sort of change Honda must have improved its wind tunnels to achieve as it's high-tech stuff. The rear bumper also adjusts to improve efficiency during fast driving. Expect some sort of ultra-smooth underbody plating as well, to channel air under the car. The wheel covers on the AC-X apparently close for improved efficiency at high speeds. The interior of the AC-X includes and extended video display toward the passenger side of the dashboard that shows a panoramic view of the city through which you are traveling. The AC-X uses joysticks for manual steering, but also seems to have an automatic drive mode where these retract. The AC-X has a charge indicator so you know how close you are to fully charged, unlike current plug-in hybrids that just have a single light to show full charge.